This Aloo Paratha is everybody's favourite in my house. I learnt this recipe from a caretaker of the hotel where I stayed when I was in UK. It is such an easy recipe that will never fail you. 1) Mix flour, salt and water together to make a soft dough. Cover it and allow it to stand for 30 min. 2) In the meantime, boil and peel the potatoes and add them to a bowl. 3) Add all the ingredients for the potato filling to the bowl and nicely mash the potatoes with the spice mixtures. 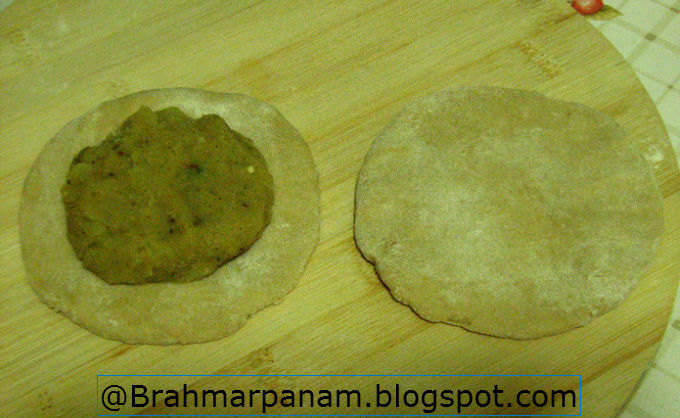 4) Divide the dough into 8 small balls (approx) and divide the potato filling into 4 small balls (approx). 5) Take 2 dough balls and roll into two 3" circles as show below. 6) Take a portion of the potato mixture and spread it on one of the rolled dough. 7) Cover this dough with the second rolled dough. 8) Press and seal the edges of both the rolled dough firmly. 9) Apply some dry flour on both sides and slowly roll into a disc of about 8 inches or till the sealing and the filling stays intact. Add more flour while rolling and keep flipping and roll on the edges first before doing the center. 10) Now put the rolled aloo paratha on a hot griddle. 11) After a few seconds add oil to the paratha and flip it over. 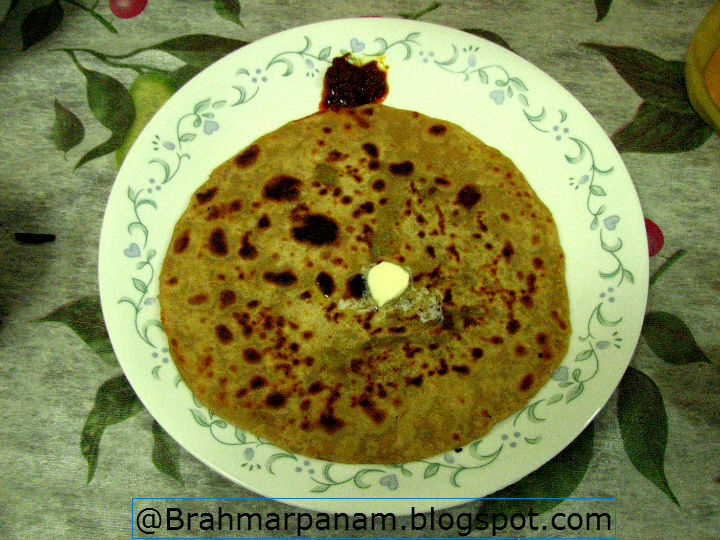 12) Again, flip the paratha and lightly press the puffed areas with a spatula. Add more oil and flip again and press with the spatula making sure the paratha is golden-brown on both sides. 13) Serve hot with a blob of butter on top and pickle or curd. The Spices/ herbs add to the potato filling can be varied according to your taste. You could even add coriander seeds, pomogranate seeds, kasuri methi or just any spice of your choice.